Saudi Arabia at a Dangerous Crossroads? 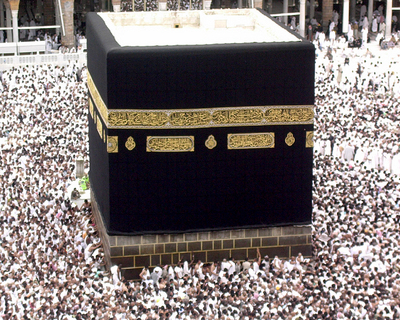 The ka'bah, Makkah, 2003 – Photograph Via Wikimedia Commons. The announcement on Oct. 27 that Saudi King Abdullah Ibn Abd Al-Aziz had appointed his half-brother, Prince Nayef, as Crown Prince and presumptive heir to the monarch has been presented by official Saudi sources and foreign media as promising a smooth transition during the social upheavals in the Middle East, which have mainly spared the Saudi realm. Prince Nayef's appointment followed the death by colon cancer of Crown Prince Sultan Ibn Abd Al-Aziz on Oct. 22. King Abdullah and Princes Sultan and Nayef are sons of the founder of the Saudi state in 1932, King Abd Al-Aziz Ibn Saud (1876-1953). King Abdullah is 87 and ailing from back problems. The late Crown Prince Sultan was 80 when he died. His successor as Crown Prince, Nayef, is around 78. Crown Prince Nayef will continue as interior minister, a post he has held since 1975. The future of the Saudi rulers, who represent the most prestigious institution of power in the Muslim lands, is therefore unpredictable, if only because of aging. Crown Prince Nayef could die before King Abdullah, leaving determination of the further succession process in the hands of an Allegiance Council made up of the remaining sons and grandsons of Ibn Saud. The Council was established by King Abdullah in 2006-07, after he inherited power from the late King Fahd, who died in 2005 following an incapacitated decade caused by a stroke. King Abdullah and Crown Prince Nayef differ, most importantly, in their images before the Saudi public and contradictory attitudes toward the future development of society. The view of Saudi subjects toward King Abdullah is the most important of these factors, and is based in the second. King Abdullah has attained a rare, if not unique degree of popular affection from those over whom he ruled, by inaugurating a significant but still-limited reform program, after he took power in 2005. Changes in Saudi public policy have included openings to participation in public life by the large Shiite minority, which is concentrated in the oil-rich Eastern Province and has long complained, with considerable justice, of discrimination by the Saudi elite. Other reforms extend to enhanced progress for women in Saudi society, ambitious modernization of the educational apparatus -- criticized for its teaching of Wahhabism, the ultra-fundamentalist Muslim ideology that remains the official sect in the kingdom -- and disengagement of the school system from the clerical establishment, dismissal of hard-line Wahhabis from positions as judges, and reduction of official support for the mutawiyin or morals patrols, the state institution most hated and feared by Saudis. Wahhabi dominance in religion is responsible for the most restrictive aspects of life in the kingdom. Wahhabi doctrine makes Saudi Arabia the only nation in the world where women are prohibited from driving motor vehicles on the roads and in the cities (although it is well known that women drive in rural areas). The same dogma commands Saudi women never to leave their homes without covering their faces with the veil or niqab, which reveals only the eyes, and their bodies with the abaya, a cloak extending to the ankles. Wahhabi clerics prohibit unrelated men and women from meeting in public or private without a chaperone from the women's family, which limits women's involvement in professional life. King Abdullah, in seeking to turn the kingdom from Wahhabi totalitarianism to a country similar to those that Saudis call "the crescent of normality" -- from Kuwait to Oman, where women can drive vehicles, dress, work and socialize as they choose, and other religions are practiced openly -- has been opposed by Nayef. Although King Abdullah announced in September a voting franchise for women, then-Prince Nayef has expressed disdain both for women's rights and for elected representation in government. Nayef is also notorious for having declared that the al Qaeda attacks on the U.S. in 2001 were probably the work of "Zionists." The ameliorative measures undertaken by King Abdullah offer a way forward for the Saudi kingdom and its people, while the retrograde outlook of Crown Prince Nayef stands for rigidity and repression in governance. Why, then, did King Abdullah designate Prince Nayef as his heir? King Abdullah is isolated within the Saudi state in his commitment to progress, as illustrated by his cautious series of his social improvements, and Wahhabi clerics continue to direct religious life. The naming of Nayef as Crown Prince was most likely a concession to the intransigent Wahhabis, forced on the reformist King. But where the late Crown Prince Sultan had no apparent interest in opposing reform, with Sultan gone, the King and the Crown Prince now present two diametrically-opposed paths to the Saudi future. If King Abdullah presses more fully his vision of reform, the inflexibility of Crown Prince Nayef could stir Wahhabi fanatics to rebellion. Rather than assuring an untroubled transfer of power -- which to Saudi officials and most Western observers seems to be a euphemism for consistency in oil exports -- the appointment of Crown Prince Nayef could undermine the stability of the kingdom. The "unity" of the opposed King and new Crown Prince could turn into open conflict. Energy assets, and income derived from them, may be less important in determining the Saudi future than the differing perspectives on public and private life of King Abdullah and Crown Prince Nayef.